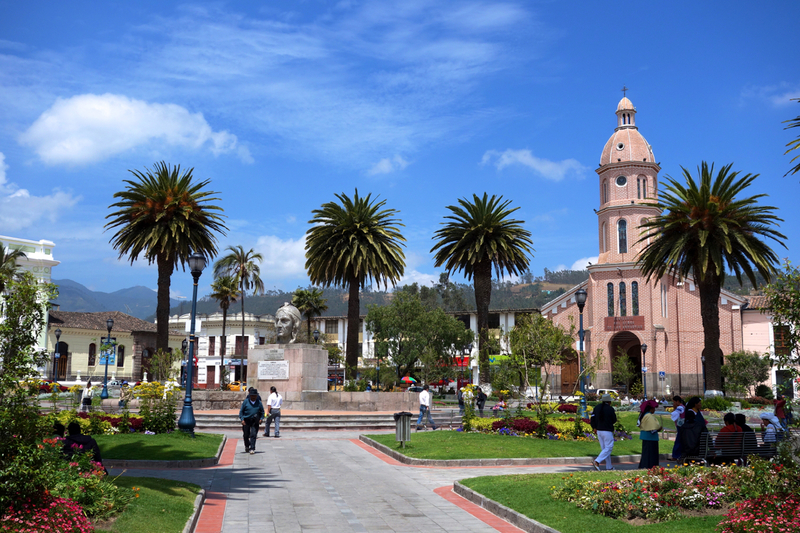 Ecuador- where to begin? It’s crazy, really. I was only there for a week- and it was a whirlwind tour for those 7 days- but somehow, I just fell in love with the place. The natural beauty, the friendly people, the rolling hills and the towering volcanoes- an outdoor adventurer’s dream, for sure. Maybe that’s why I liked it so much. And to think- I only had time to hit 3 or 4 of the countless highlights along the way. Alas, I know my time in South America is brief, and I have to make the most of every second… That’s what I tried to do in Ecuador. 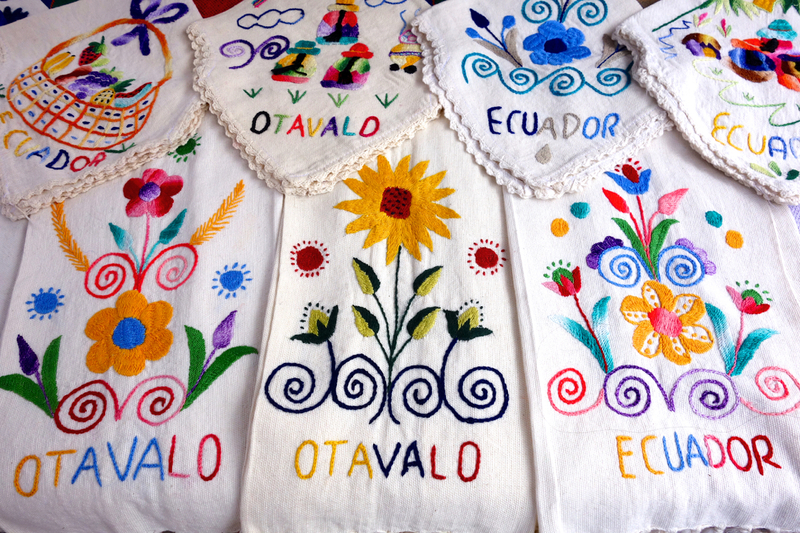 I arrived in Otavalo- a small town in the northern part of the country- after a day-long mission of a trip from Popayan in southern Colombia. 5am alarm, 6 hour bus to the border, minibus ride to the exit checkpoint, walk across the border, entrance formalities in Ecuador, taxi to the bus terminal in the next town, and another 5 hour bus ride to Otavalo. Have I ever mentioned how much I LOVE Moving Day? Ugh… Anyway, I arrived in Otavalo after dark, in the rain, and was glad to have a taxi waiting to take me to my hostel- for $1. (Quick sidenote: I quickly realized that one of the bonuses of traveling in Ecuador is that they use US Dollars as their national currency- no confusing exchange rates, no mind games with bargaining prices… Muy facil!) I got checked into my hostel, ventured out for a bite to eat, and then headed to bed- I knew I had a full day on tap, and needed some rest after the long journey from Colombia. The next day, I grabbed a quick breakfast at the hostel (Included with the price of my room), and then made a plan for the day. 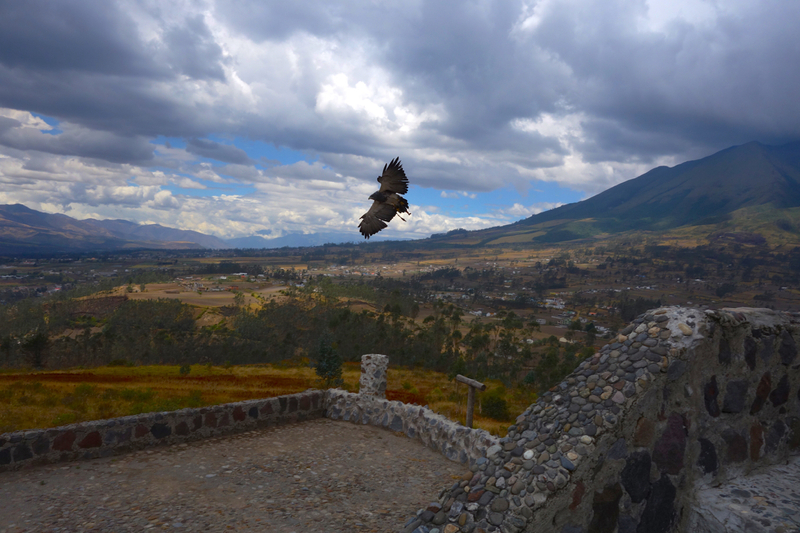 There was a local bird sanctuary that focused on rescuing birds of prey found abandoned or injured in the wild, and in addition to their resident Andean Condors (the world‘s largest land bird, with a wingspan up to 11 feet), they had daily flight demonstrations which were supposed to be pretty incredible. There was also a local hike that circled around a dormant volcano crater in a small village outside of Otavalo. I had met a German couple at the hostel that said it was spectacular, and perfect for a half-day hike of 4-5 hours. Game. On. I hired a taxi, and headed up the rocky, ruddy, pot-holed, road to the Parque Condors, bought my entrance ticket, and began my tour around the grounds. 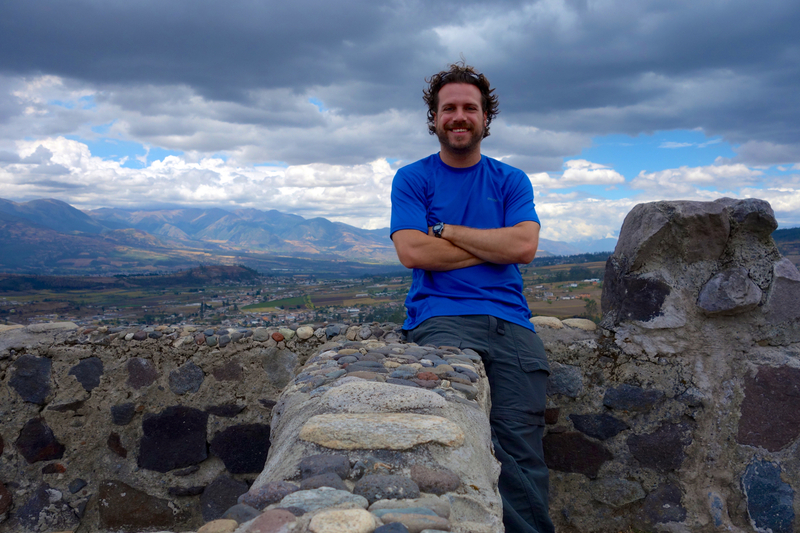 I was immediately taken aback by the scenery- Ecuador is GORGEOUS, with rolling green hills, towering rocky mountains, and silky white clouds drifting across a impeccably blue sky. Yeah, there were several interesting birds to see, but the view from that hillside was AMAZING. Now THAT was what I came to South America for… I took a few (SEVERAL) pictures, even broke the video camera out to document the moment, and then had to hustle up to get to the flight demonstration area in time for the show to begin. The flight demonstration was pretty cool, despite it being orated totally in Spanish. My Spanish is coming along, slowly but surely- I was able pick out a few words here and there, and make some sense of what the guide was saying. I think… Anyway, he brought several different species of birds out to display, even let some of the spectators hold one of the smaller ones, and then had a few that he was going to release into the open air to demonstrate their soaring abilities, etc. The trouble was, the first one he released decided it wanted to have an extended flight that day, and simply soared on the breeze for the next 30 minutes. He brought more birds out in the meantime, and gave us an opportunity to get a few photos of the massive condors. Eventually, the wayward eagle had had its fun, and came ZOOMING back onto the guides arm- very impressive, and it was only by sheer luck that I had my camera ready when she came swooping in. It was intense- it sounded like a small jet coming in for a landing… Very cool. We tried to get him to let us hold the bigger bird, but he laughed and shook his head. Hey, it can’t hurt to ask, right? 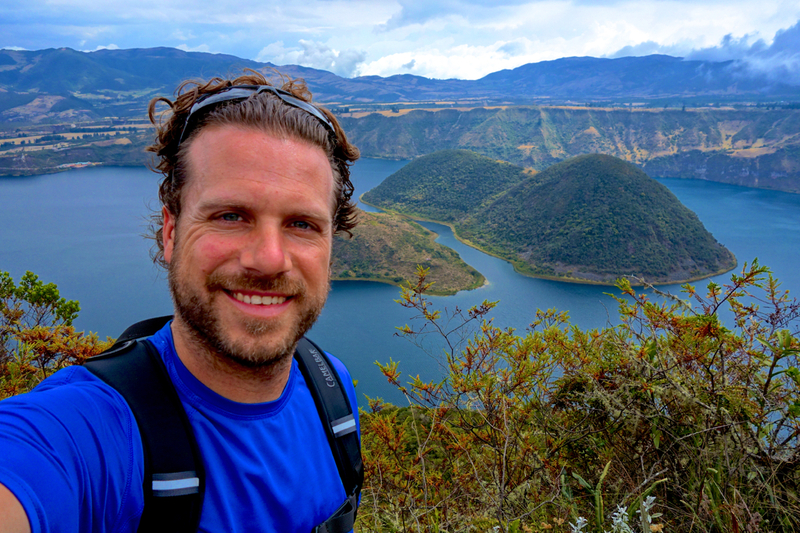 After the flight demonstration, I hopped back in my taxi and headed straight for the trailhead of the Laguna Cuicocha- the dormant volcano that had since become a lake and a popular hiking destination for locals and tourists alike. The trail was supposed to take between 4 and 5 hours, and followed along the very EDGE of the crater wall as it circled the lake below. I asked the park ranger a few questions about security, time, and weather, and with a shake of his head and a ‘Tranquillo, amigo- todo esta seguro’, I was off. The hike was incredible. Again, the magnificent scenery of Ecuador spread out for miles and miles around the crater, with the hills and mountains disappearing into the clouds in the distance. 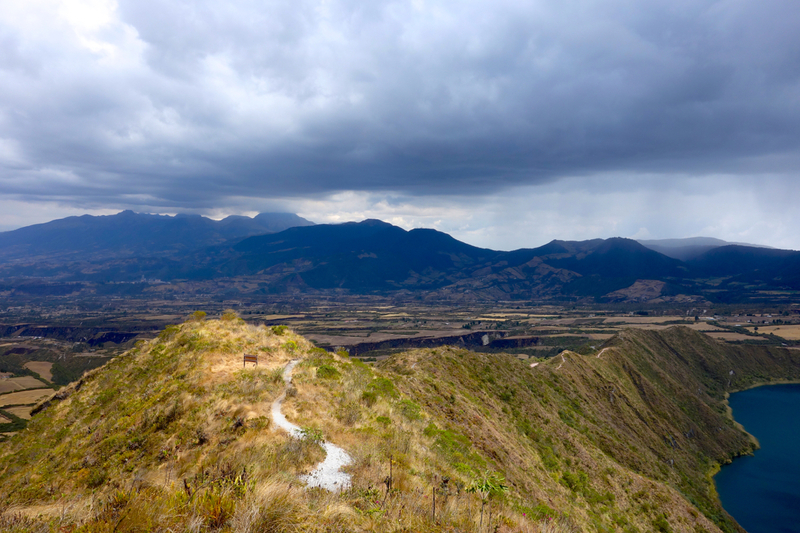 I had a spring in my step as I set out, anxious to take on the trail, but that was quickly quelled as the thin air of Otavalo reminded me of the 2550m elevation. Whew! Maybe I wasn’t going t be breaking any time records for the circuit… Oh well, better to slow down and enjoy the scenery anyway, right? And what scenery it was- the crater itself was MASSIVE, with sheer cliffs dropping hundreds of meters into the waters below. Signs cautioning against getting too close to the edge were posted everywhere along the trail, hinting that perhaps someone may have gotten a bit too close in the past. The trail was in great condition- very well kept, marked clearly at every turn, and meandered along the edge of the crater. I had to stop several times for photos- and to catch my breath- but after I reached the highest point, it was mostly all downhill from there. There were some ominous clouds rolling in, and I could hear thunder in the distance, so I had to hoof it towards the end of the circuit, but it turned out to be a non-issue- the clouds got stuck in a neighboring valley, and the sky cleared up over the crater. I made it back to the lodge just as a couple of local workers were leaving, and they game me a lift back into the village, where I caught a bus back to Otavalo. Yes, I was exhausted, but it had been a great day. I had a bite to eat, and collapsed into my bed with a smile on my face. Welcome to Ecuador! The next morning, I was scheduled to be on a bus headed south around noon, but wanted to check out the local craft market first. 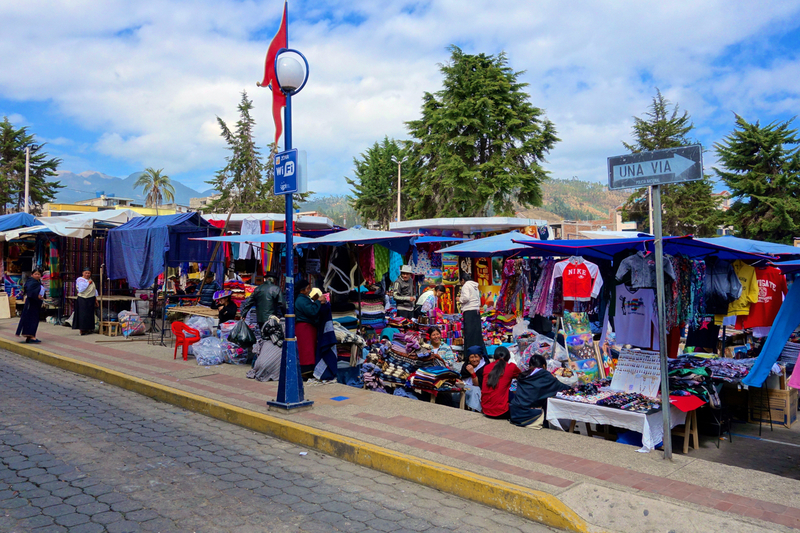 Otavalo is famous for having the largest craft market in South America- on Saturdays, traditionally dressed indigenous Ecuadorians descend on the town in droves, selling anything and EVERYTHING imaginable to the locals and tourists poring through the stalls of the market. Supposedly, it is quite a scene… I was there on a Tuesday, and was blown away by the size of the market and the diversity of what was on offer- hand-made scarves, jackets, shirts, dolls, and hats; printed paintings, artistically woven handbags, hammocks, chairs, and purses; fabrics and textiles of every texture and color; food the like of which I had never seen, smelled, or tasted… It was amazing. I could only imagine what it would’ve been like on a Saturday. Maybe next time… I perused the market for a while, making sure not to feign too much interest in order to avoid being heckled by the vendors, and then had to head to the bus station. 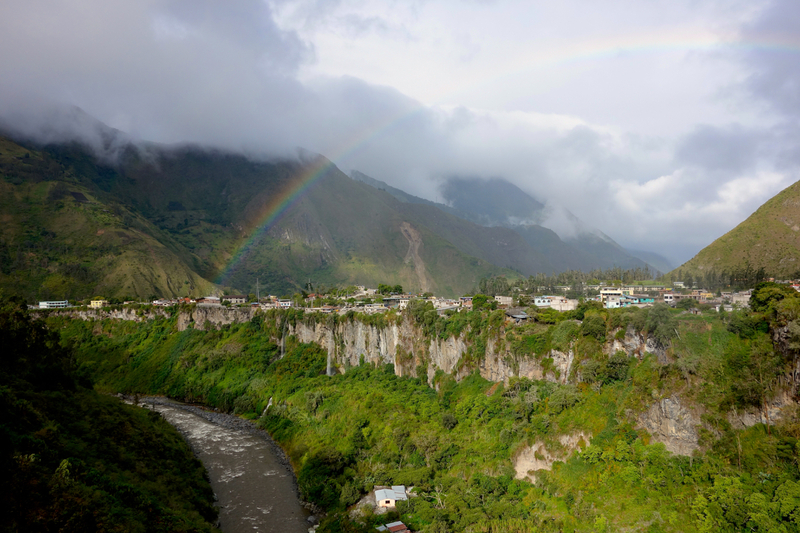 It was a 6 hour bus ride to Baños, the next stop on my trip through Ecuador. 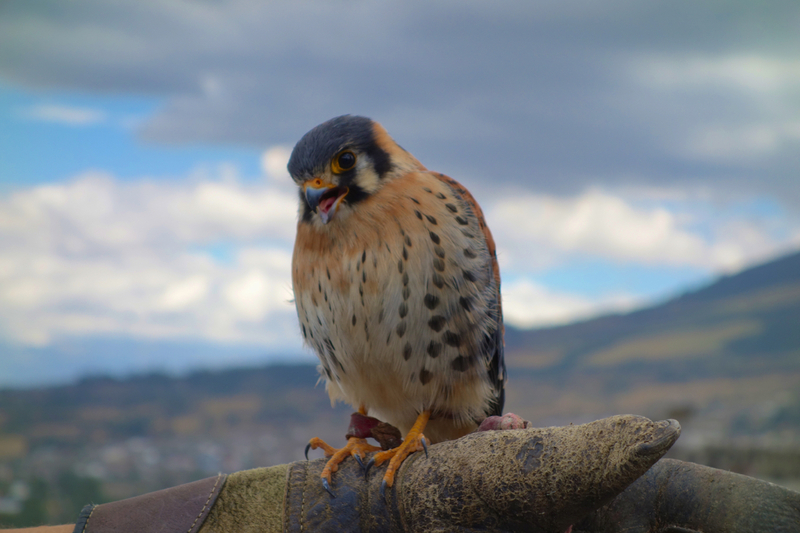 I had decided to bypass Quito in the interest of doing more outdoor activities- I had seen several cities in Colombia, and was keen to stay out of the urban areas and instead continue to take advantage of Ecuador’s natural beauty. 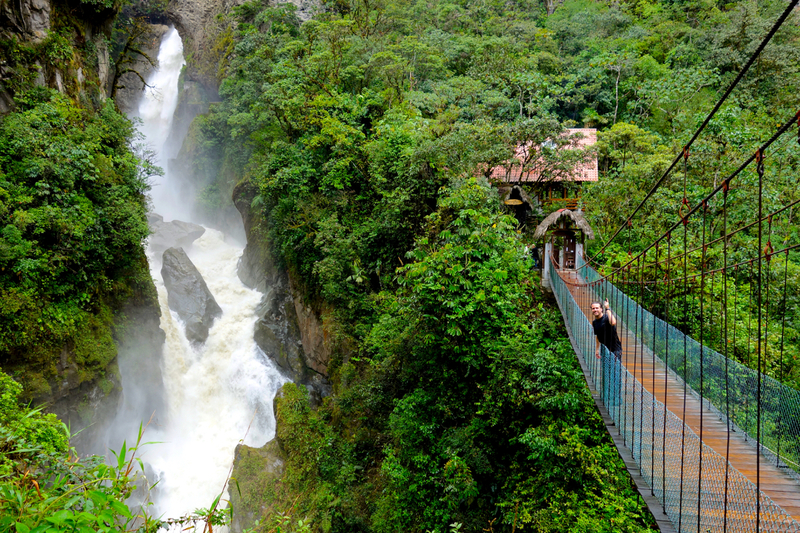 I had read great things about Baños, and knew that would be a great spot to continue the adventure. The night in Baños was a good time- we wandered around, hit a couple of bars, and found this great place with a massive firepit going, which was perfect on a cool, damp night. We all agreed to meet up the next morning to plan some activities for the day, and I made my way back to my hostel for a good night’s sleep. The next day, we decided to hire a 4-wheel-drive jeep to go explore all of the local waterfalls around Baños. 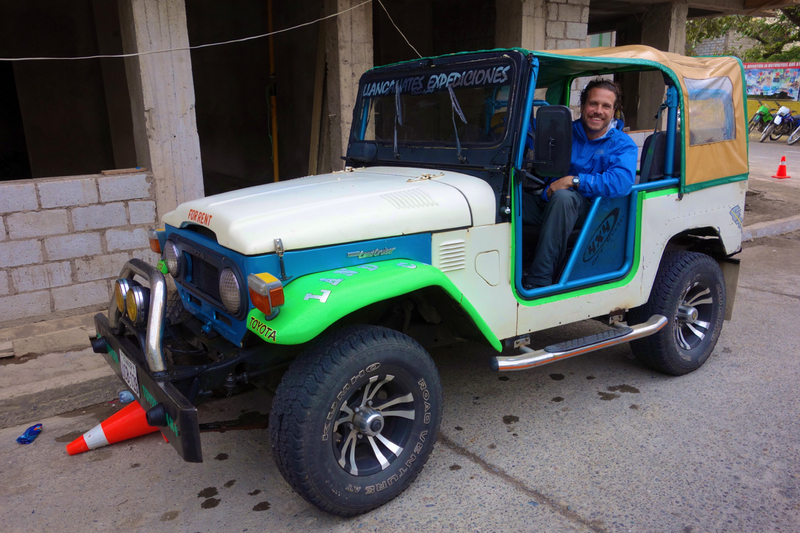 Somehow, I got nominated to be the driver, and found myself behind the wheel of this crazy Ecuadorian Jeep, with 3 people’s lives in my hands on the winding roads through the mountains around Baños. Good times! Did I mention it was raining, the roads were WET, and that the jeep had a quarter-turn delay in steering response? No? Oh, well, add that into the mix… Regardless of all of that, we had an amazing day, and it was a great adventure… We saw several waterfalls, culminating in the Pailon del Diablo- the Devil’s Cauldron- a MASSIVE cascade pummeling through a narrow gap in the rocks just outside of town. It was INTENSE- so much water smashing through this tiny area, shooting mist and spray high above the waterfall itself. It was pretty awesome, but there was so much water, you couldn’t get near it with a camera- we were SOAKED within seconds. We were able to cross a small bridge over the ravine and get some photos from the other side, but still, it was nothing compared to being next to the waterfall. There was also a small crawl space we shimmied up that allowed us to stand directly behind the gushing water. It was incredible, and a bit scary, to be honest- there was just so much water. We quickly climbed back down, and then headed back up the trail to try to get warm. We were soaking wet and FREEZING. That is one SWEET ride! Our transportation for the day in Baños- clear the roads! We had to hurry to get the jeep back to town, and then I headed directly for the fireplace in my hostel, trying in vain to get my shoes and clothes to dry in the damp air. Still, the fire was warm, and it was the perfect way to warm up after the long, damp day. I met up with the rest of the crew for dinner, and then we hit up a shisha bar and a crazy local dance club- it was a great end to a great day in Baños, that is for sure. 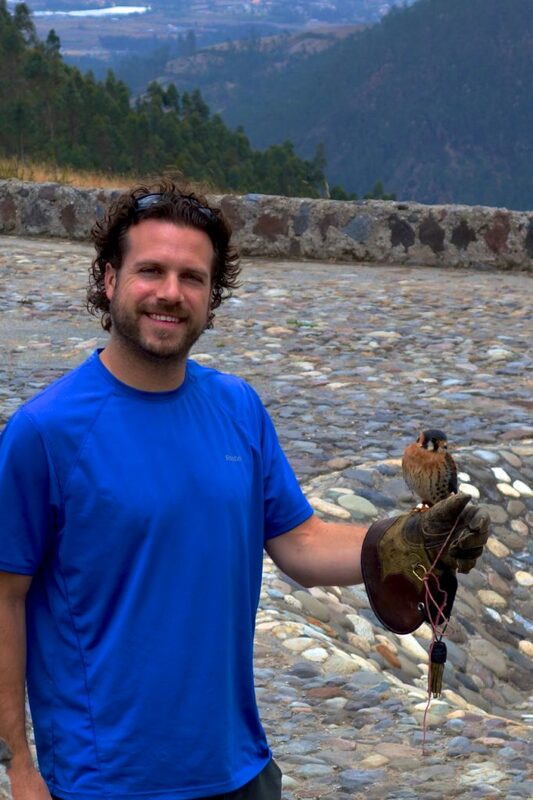 Alas, my time in Ecuador was coming to a close- the Andes were waiting, and it was time to head to Peru! 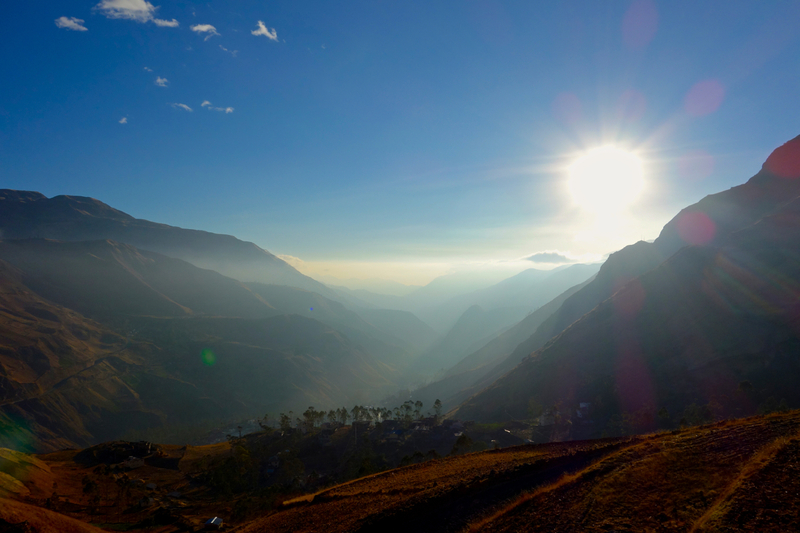 The next day, I hopped on a bus headed south, and started the long journey towards the Peruvian border… But, the story of THAT epic journey will have to wait until next time.